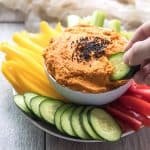 Paleo & Whole30 Roasted Carrot Dip – a delicious and healthy appetizer everyone loves! Gluten free, grain free, dairy free, sugar free, low carb, vegan, clean eating. 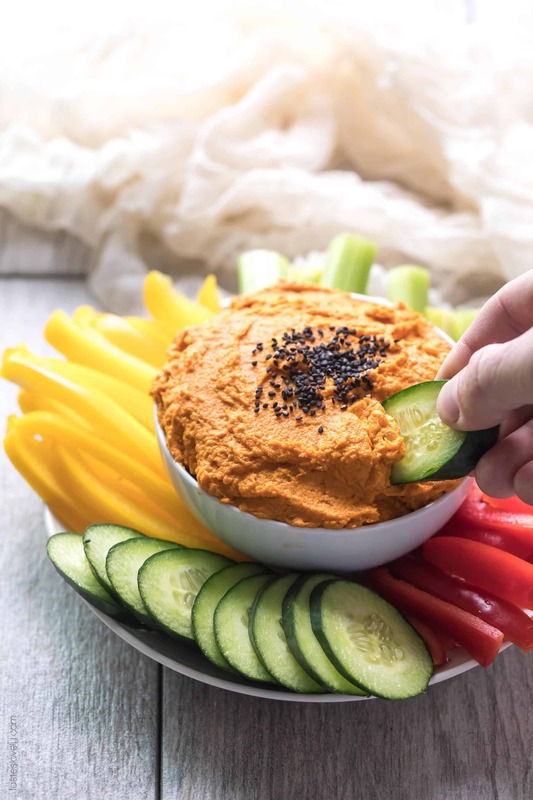 This Paleo & Whole30 Roasted Carrot Dip might be the most universally loved and devoured appetizer I have ever made. Not only is it delicious (so delicious! ), but it is friendly for every diet there is! Whether you’re paleo, Whole30, gluten free, grain free, dairy free, sugar free, vegan, vegetarian, low carb, you name it. 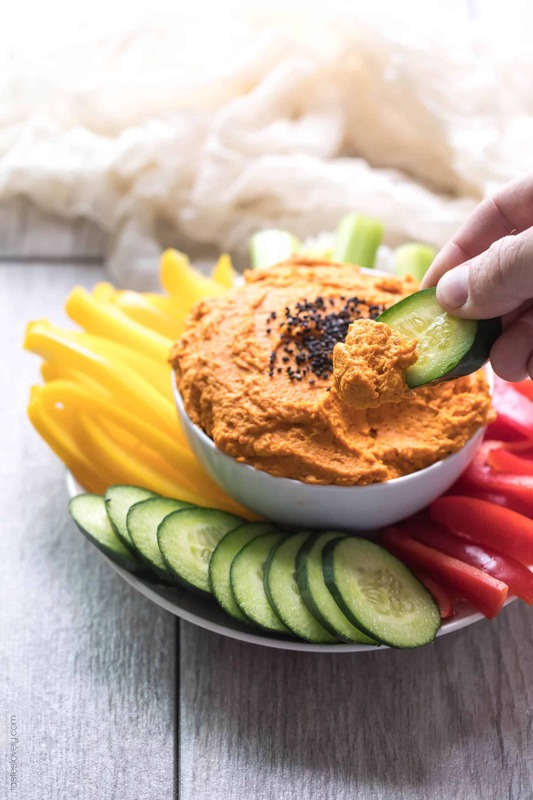 This dip is so healthy, everyone can love it. Thanksgiving is coming up, and I love being in charge of appetizers. If you’re like me, you skip lunch on Thanksgiving, and when you show up you are ready to dig in to some appetizers to curb your hunger. I secretly feel like appetizers get extra attention and praise because of this. My family has people on all sorts of different food restrictions. Some are vegan, some are paleo, some are gluten free. 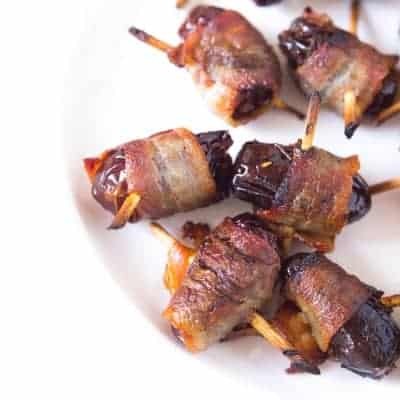 So finding an appetizer everyone can enjoy can be tricky. Enter the Roasted Carrot Dip. 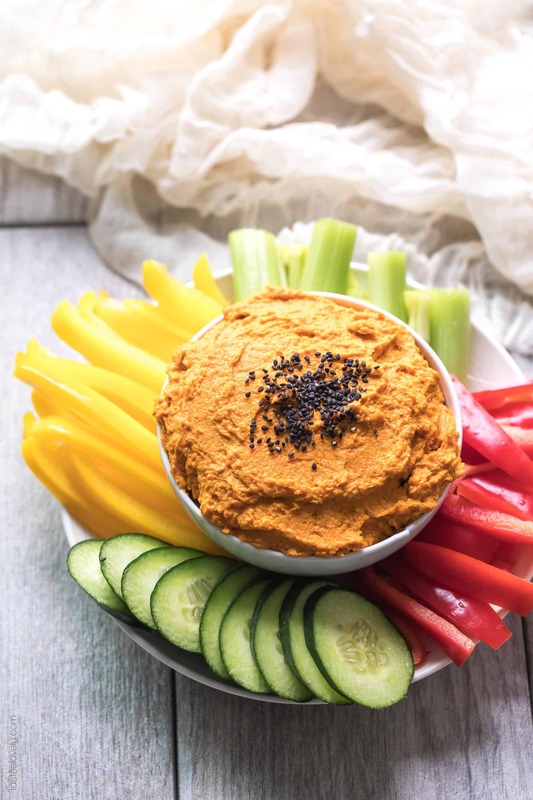 All that is in the dip is roasted carrots (yum! ), tahini, garlic, olive oil, salt, pepper and water. That’s it! The food processor does the rest of the work for you. The secret to the dip is roasting the carrots. 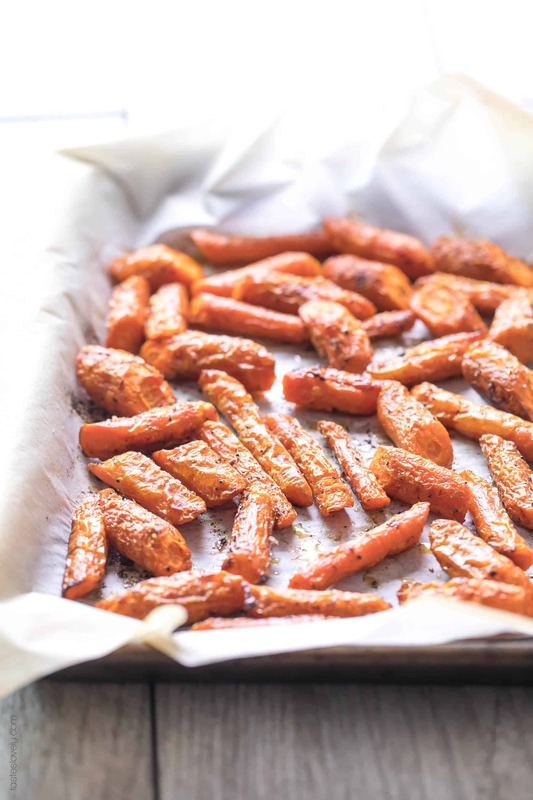 When carrots are roasted, it brings out their natural sweetness and earthiness. After roasting the carrots they get that nutty, caramelized flavor that I love. My absolute favorite way to enjoy carrots. I like to keep this dip really simple and season it with just salt and pepper. I find the carrots are so delicious after being roasted, it doesn’t really need any additional spices or herbs. It’s also a great, clean palate dip to have before a big meal. But if you feel like a adding a little more zazz to it, it would be great to add in some cumin, or paprika, or fresh thyme or rosemary. Whatever you’re craving. I serve it with fresh cut vegetables and/or crackers, pita chips, or my paleo and gluten free almond pulp crackers to be diet friendly. I top it with some black sesame seeds just for looks. You could also do a swirl of olive oil or dash of paprika. 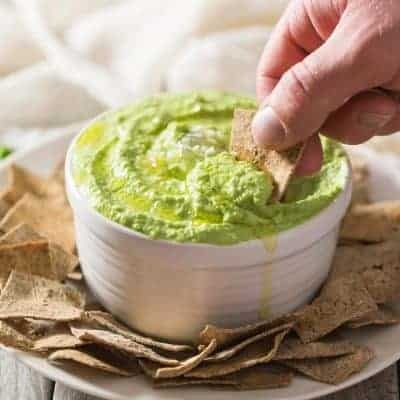 You can make this dip a few days ahead and store it in the refrigerator. It is best when the dip is room temperature, so I take it out of the fridge an hour or two before my guests arrive. 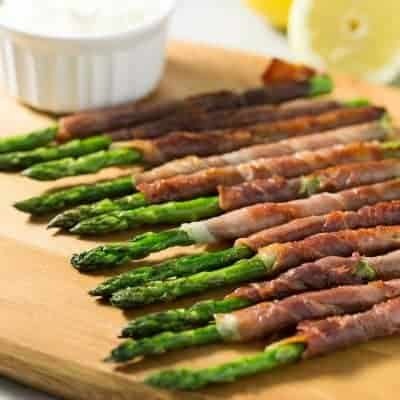 It makes it a lot easier to dip in to, and when it is room temperature you can taste the flavors the best. Preheat your oven to 425º. Toss the chopped carrots with the olive oil, salt and pepper. Spread in an even layer on a parchment paper lined baking sheet. Roast for 40-45 minutes, until soft and browning on the edges. 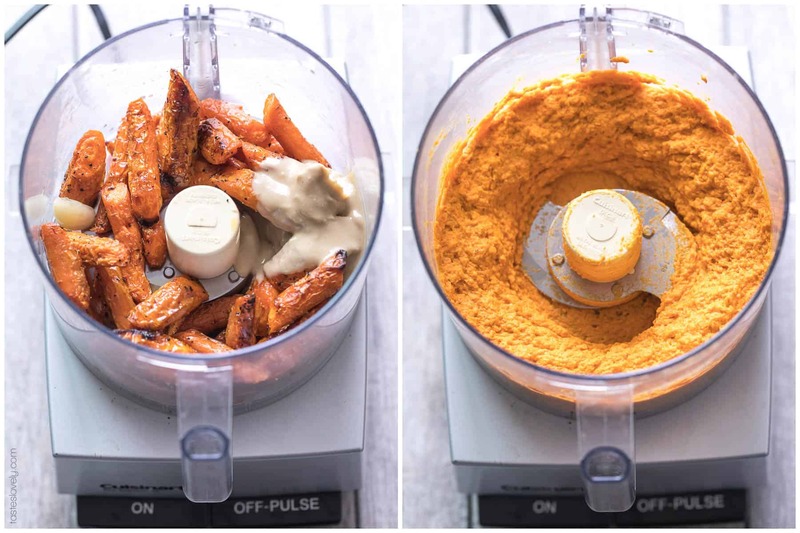 In a food processor with the S-blade, combine the roasted carrots with the tahini, water, red wine vinegar and garlic clove. Blend until combined, scraping down the bowl once or twice. Serve room temperature with cut veggies and/or paleo almond crackers. Will keep in an airtight container for 1 week in the refrigerator. I like this dip best at room temperature. If I make it ahead, I’ll take it out of the fridge an hour or two before serving to guests so it can reach room temperature.